Hi, I recently brought two houseplants whose names I do not know. Sadly, they both seem to be dying. I have attached pics of the two plants. Plant 1 in the pic, has purple color under its leaves. 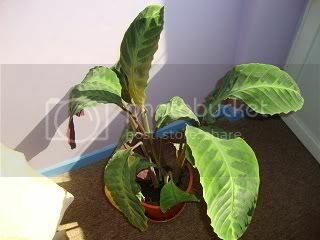 Of recently, the plant has yellowed leaves and some leaves have brown wilting at the edges. I water the plant once a week with 3 glasses of water. Plant 2 seems to be doing a little unwell too, keeps losing its leaves. I do not have much sunshine in my apartment, I mean barely any. could you please identify them and advise how to take care of them? 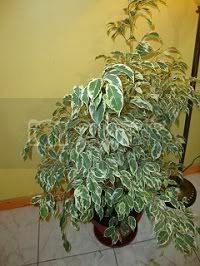 The top one is a variegated ficus. Sorry to say, but they need plenty of light, probably 1/2 day of bright sun. They are even more fussy than their non-variegated parents. A weekly watering might be too much if you're trying to grow it in a low-light situation...they don't like to be damp, just moist. It would be a great Christmas present for a friend with a brighter spot. The bottom looks like a calathea, but there are so many cultivars, that I can't say which off the top of my head. Here you're in luck, because they like lower-light situations. But they don't like cool or drafts or ANY direct sun. The most common problem is over-watering, which normally first makes the leaf tips die, then the whole leaf. I would try cutting back on water. Again, you're going for moist but not damp. Stick a finger a couple inches into the soil. If it's dry there, then water well. If it's still moist, wait a couple more days. @microcollie: I thought variegated ficus for the first pic, too, but then noticed that the OP stated the undersides of the leaves are purple. Do you happen to know the name of that cultivar? It's a new one to me. Thank you so much microcollie!! I hope I can now save these plants. @Kisal: I confused the pics while uploading them, so the purple color under leaf is for the calathea and not the variegated one. Thanks again, you lot are great ! Ficus usually don't like being moved too much, so just pick the brightest window and leave it there (they need a lot of light). Additional lighting may be required (you can find a thread on that in the Bonsai Learning forum I believe). And thirdly, whilst they like humid air, they'd rather have dry soil than wet. Pretty much, don't water on a schedule, but when the top half to one inch of the soil feels dry(-ish, not bone dry) to the touch - you gotta stick your finger in to test it (or look up the skewer method). When you water, do so thoroughly, and then wait for it to dry before you water again. Never let the plant sit in water, be it in the drip tray or a pot with no drainage (drill some holes in the bottom if that is the case). Oh, and you may be doing everything not too badly, some ficus just throw a 'hissy fit' when they are moved to a new environment, repotted, pruned, etc... Small changes is the key. basically, just check all its needs, give it the best you can and keep things steady. either it will recover or not. can any houseplants be close to a lamp?